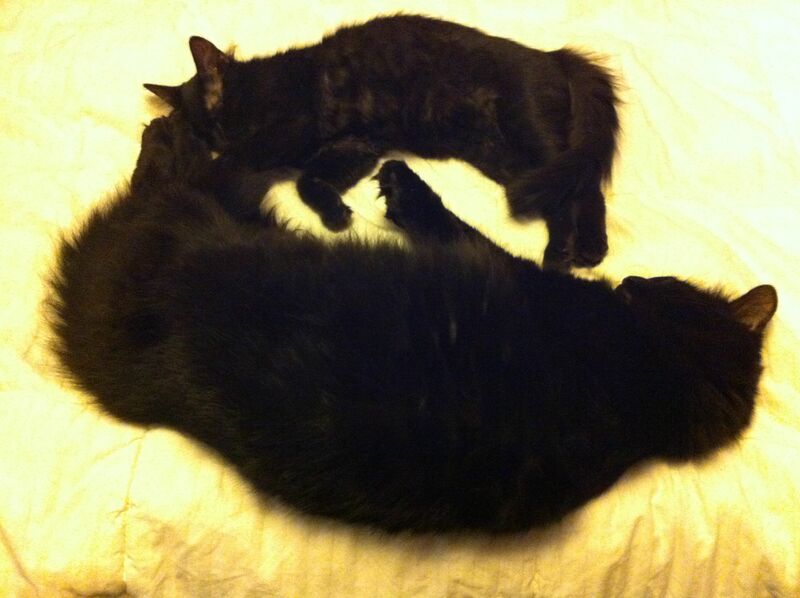 In December 2012, we adopted a tiny black kitten from the local SPCA. 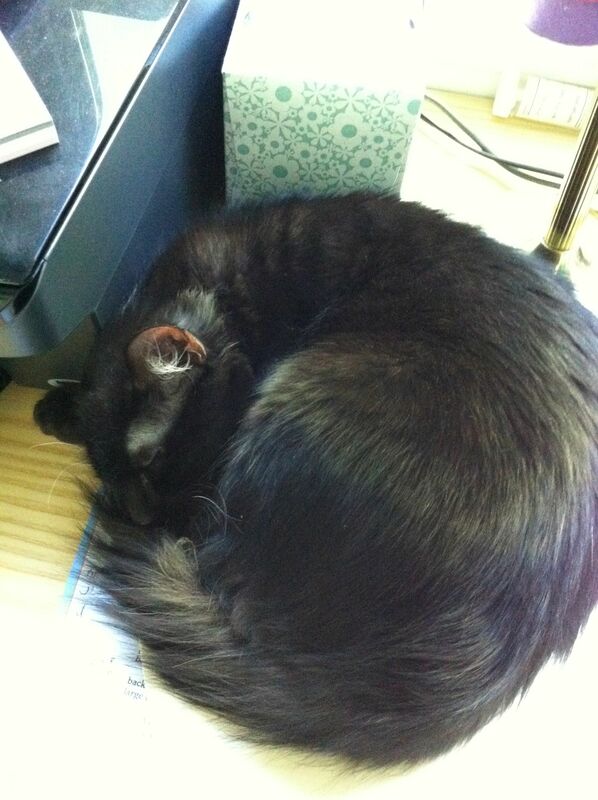 He was meant to be a companion for our older cat, another SPCA baby we called Nocturne. She was 3. The kitten was named Scrappy, because he’d been discovered on the conveyor belt at the massive recycling center at the San Francisco dump. Someone had put him into a recycling bin at the curb, from which he got dumped into a truck. It was a wonder the trip hadn’t killed him. We had already signed the paperwork for him when the adoption counselor said, “Oh, he’s been fostered. Let’s see what they had to report.” Warning bells should have gone off: he’d vomited a lot. They’d worried and fussed over him. But we’d fallen in love — and the paperwork was signed and our credit card already charged. So we brought him home. He immediately came down with a respiratory infection. The SPCA wouldn’t see him for two weeks, so we tried another vet. They diagnosed an allergy to his plastic food dish, which was making his lower lip swell. That was the first allergy. We went through cat food after cat food, trying to find something that he could keep down. They thought he might be allergic to chicken. Or maybe dust. Or maybe the other cat. In his first three months, Scrappy — now named Morpheus — saw four different doctors at three different clinics. They diagnosed a flea problem (although we have seen never seen a flea or suffered any bites). 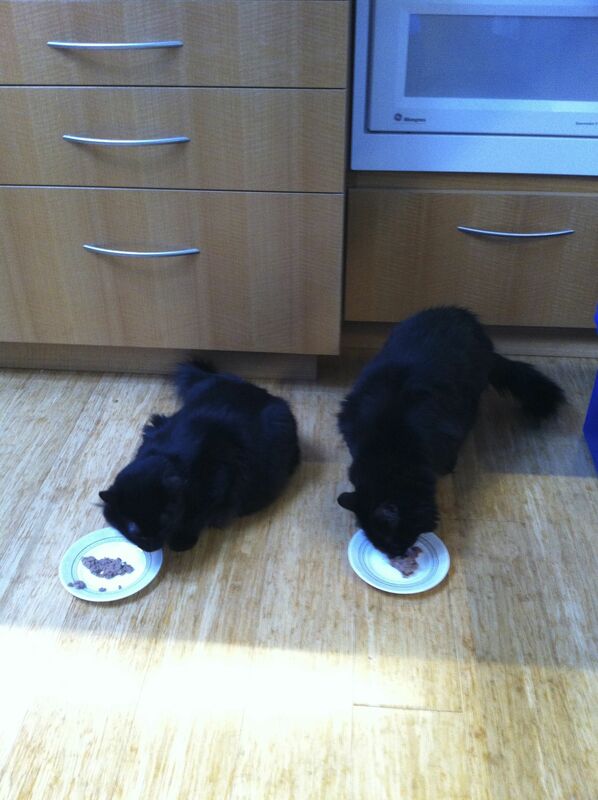 They prescribed Omega 3 oil (which he ran away from) and sardines (which Nocturne loved). He took a daily immune booster and two kinds of spleen pills. His weight ballooned. He would lick the fur from his skin, then lick his skin until it bled. We were in for steroid shots or antibiotics or both over and over and over. The interval between treatments grew shorter. Through all of this, both my husband and I were working at home and neither of us was getting paid. The bills added up. Yesterday the doctor prescribed a daily steroid cream. It’s being made by a compounding pharmacy here in town. I was afraid to ask how much it would cost. He’s supposed to stop eating the $30 cat food and starting eating raw food, which is $50 a bag. The pet store didn’t have the salmon flavor the doctor ordered, so I brought home rabbit. Neither cat will touch it. For a long time, I wanted to keep Morpheus, to nurse him. I wanted to show my daughter that you keep the commitments you make, even when you don’t understand what they are when you make them. I had no idea what we were in for when we brought our boy home. I feed him measured amounts four times a day. I give him his pills, which he loves. I am home to keep him company. He sleeps beside my knees at night and wakes me in the morning. But as much as I love him, I’m beginning to realize that we cannot care for him much longer. Yesterday, the doctor noticed that his body had started resorbing his teeth. It’s related to his immune disorder. They see it in older cats, but Morpheus is barely 18 months old. The treatment is to start pulling his teeth. And the news broke me. We can’t spend $600 a year on cat food and thousands more on vet bills and medicine and watch him continue to be sick. All this time, I was hoping we’d find the right combination of food and medicine and, with enough love, he would be a normal cat. But now I think that point has passed. It’s only a matter of time before he reacts to something and it kills him. He’s been depressed this week, hiding under a blanket and sleeping the hours away. His teeth have hurt enough that he doesn’t eat like normal. He’s got two areas that he’s licked raw again. If the daily steroid cream doesn’t help him, we may be out of options. I don’t know what to do. Would he be better off in another home, an only cat with another stay-at-home human to dote on him, someone who could afford monthly steroid shots? Should he go into kitty hospice? How long do we force him to stay in this world when he’s so allergic to it? Loren my heart breaks reading this. I had a black cat named Nocturna (Smokes) she lived 25 years and looking at your cats I deeply sympathize with you. What a hard decision to make. We had a puppy that needed surgery for hip displasia (sp?) and we couldn’t afford so we gave the dog to the Vet to find a home for him. One of the workers there adopted this dog. Thanks, Erik. Morpheus is such a sweet boy with a big purr and a little tiny meow… He’s completely charmed our vet. I think she would help us find a home for him, if we get to that point. For now, I’m hoping the new medicine will work a miracle that everything else hasn’t been able to. It’s so hard to watch animals suffer. Loren, So sorry to hear you going through this…I was just given a kitten to find a home for…my other 3 cats (all rescues) are eyeing her warily…& my 2 dogs (1 a rescue) are very interested in learning whether their mother really is such a whack job, that she would take in another. My step-daughter brought her over…needing an immediate shelter before she could track it’s owners, find it a home, or convince her husband to allow her to keep it. It’s now the end of Day Two. I say all this to let you know I am a sucker, and an animal lover. I empathize with you…the food bill and medical bills for all animals are impressive…especially as one dog has allergies…so both eat high-grade no grain products…and are big boys/eaters. My husband and I also are self-employed…and definitely not in the top 1% by any means. But here’s my advice…you have showered this lovely creature with love, attention, and all the medical care he could get. I would gently help him into that dark night…which I believe would lead to a gentler, better realm for him. To not help him in his greatest time of need would only lead to more suffering — not only for him, but any possible new owner. No teeth! No skin! Ans he feels your sadness and disappointment right now…poor little thing. And you too! Bless you both, and let him go…I truly think it’s not only alright, but the best thing for him. Peace, love, and blessings to you, your husband and your furry ones. I think you really do understand where I’m at. Yesterday, after I wrote this, Morpheus had a fairly good day — and we’re still waiting on the new medicine — so I feel like the dire decisions have been put off for now. There will come a day, though… too soon for my little guy. I should have known you were a cat person. My last cat is a long-haired black female named Wiccan and is 14 years old. I found her as a kitten one hot July abandoned. I would have said put yours to sleep but since Morpheus had a good day you can put off the decision. You have given it love when it needed it. Keep us posted! Thank you. I sent a note to the vet, asking for her honest appraisal of his future. We finally got the new medicine yesterday, so hopefully it will make all the difference. If not, well, I’ll burn that bridge when I come to it. I should have guessed you were a cat person, too. Loren, I’m going through the exact same thing this week with my three-year-old cat — teeth resorption, mouth pain, probable stomatitis; he’s having his teeth pulled next week — and I promise you this isn’t the end of the line. It doesn’t have to be bad news! Cats can do extremely well without teeth — yes, even eating hard food. My elderly tabby has about three teeth left and she’s way too tubby. Once Morpheus has the teeth pulled, he will feel better because the infection is gone and the source of pain is gone. He’ll be groggy and probably grumpy for a few days, but then he will bounce back to being the sweet kitty you first fell in love with. And your vet will surely let you set up a payment plan to handle the bill in installments. Right now, Ambrose is eating/licking Fancy Feast with added water, mushed up to soup texture and warmed in the microwave. It hurts him to bite or open his jaw wide, but licking up food is something he can manage. I don’t know if you want to continue the raw food, but you could make it into a slurry that Morpheus can just lap up — it will be easier on his poor mouth. Ambrose has some kind of compounded meds — buprenorphine, I think — that we shoot into his mouth with a syringe. If Morpheus isn’t getting that yet, I’d ask your vet for it — it seems to have a numbing effect on his jaw, so he doesn’t squeal in pain and run away from his bowl like he was doing. Good luck to you and Morpheus. I know how hard it is to see a beloved animal in pain. Thank you. It’s really good to hear from someone who’s gone through all this before. Did your kitty’s immune system ever switch on, too? Morpheus has licked two more places on his foot raw, so now he’s working on stripping one leg of its fur. I’m hoping the steroid will kick in soon! I don’t know if that will stop his body from resorbing any other his other teeth, but if it keeps him from licking his skin bloody, it will be a blessing.